Protect your pages with a password. These pages will only be readable by the visitors who know the page secret code. This functionality is available for all the Premium and Pro websites. Do you want to protect some of your pages? It is really simple. Go to the site builder tool and select the page you want to make private. Then click on ☰ located in the bottom tool bar and select Protection. Then select Password and enter the secret code, your visitors will have to enter to be able to see this page. The last step is simply to publish your website. You can now visit your website and you will notice that you cannot see the content of your protected page unless you enter the secret code. The password is recorded for 24 hours ; thus, your visitors will not have to enter it again to read this page in the mean time. 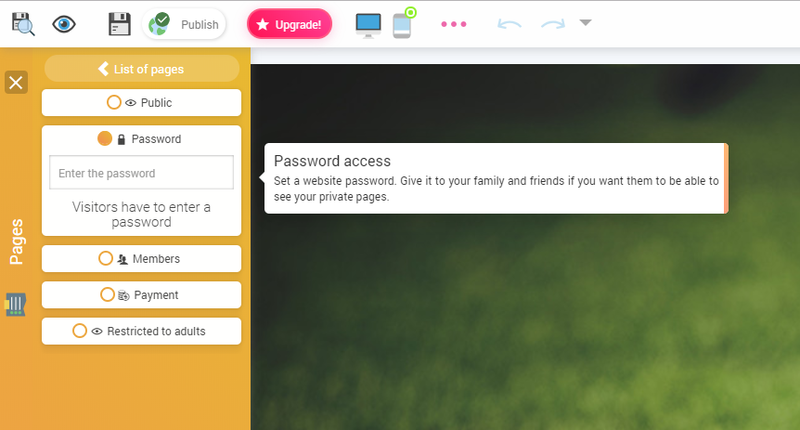 You can set private as many pages as you want and choose a different password for each page. However, we advise you to keep the first page of your site public. If you want to keep the page secret and if you do not want your visitors to feel lost, it may be a good idea to remove this page from the menu. To do so, simply untick the "Pages listed in this menu" checkbox in the page properties.